This blog post is by Erica Lome, a student in the History of American Civilization Ph.D. program at the University of Delaware. This fall, she will be a Graduate Assistant at Nemours Mansion & Gardens. You can find her at http://ericalome.com/. 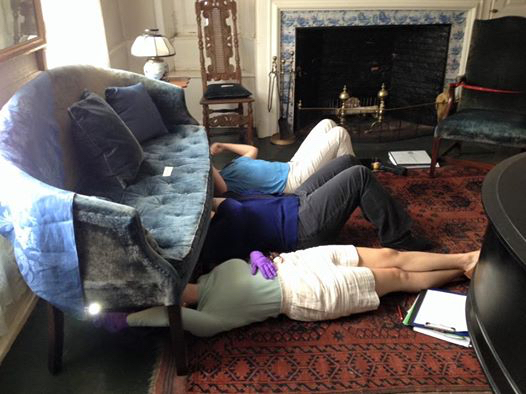 Walking into an eighteenth-century house to find three women with their legs sticking out from halfway underneath a sofa makes for an interesting sight. For me, it’s all part of a day’s work. This summer, I’m joined by three other young historians as a member of the Boston Furniture Archive. We will assess, catalogue, and photograph objects from historic institutions throughout the greater Boston area. The Boston Furniture Archive (BFA) is an extension of the Four Centuries of Massachusetts Furniture project (organized and operated by the Winterthur Museum), which seeks to explore and celebrate furniture-making in the Bay State. 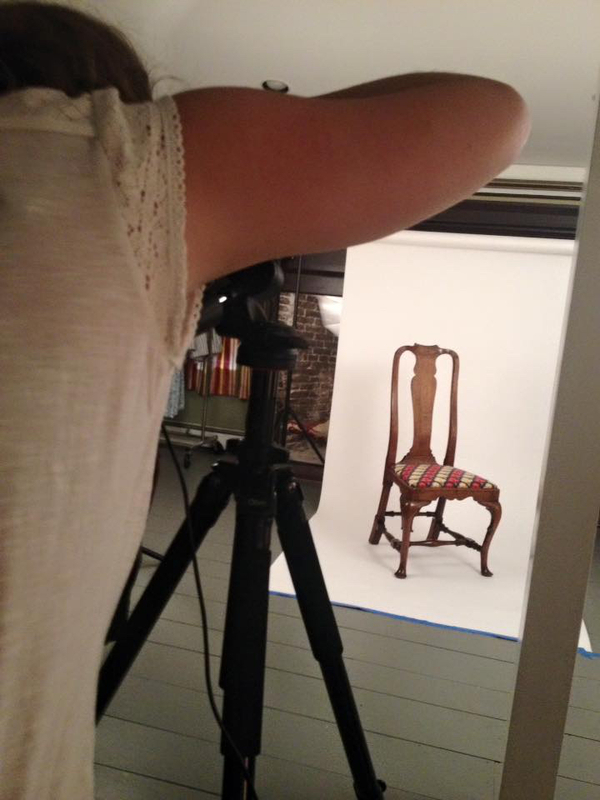 As part of our summer’s duties, we’ve been trained to examine objects ranging from Windsor chairs to high chests. Already in its third year, this is an extensive and ongoing cataloguing project that will benefit scholars of material culture in untold ways. Before we could even begin, I joined my BFA cohort in Boston for a week-and-a-half-long training session held at various institutions hosted by some of the leading experts in the field. At the Trustees of Reservations, Broke Jobe (who, with others, literally wrote the book on southeastern Massachusetts furniture) took us through a decorative arts boot camp. 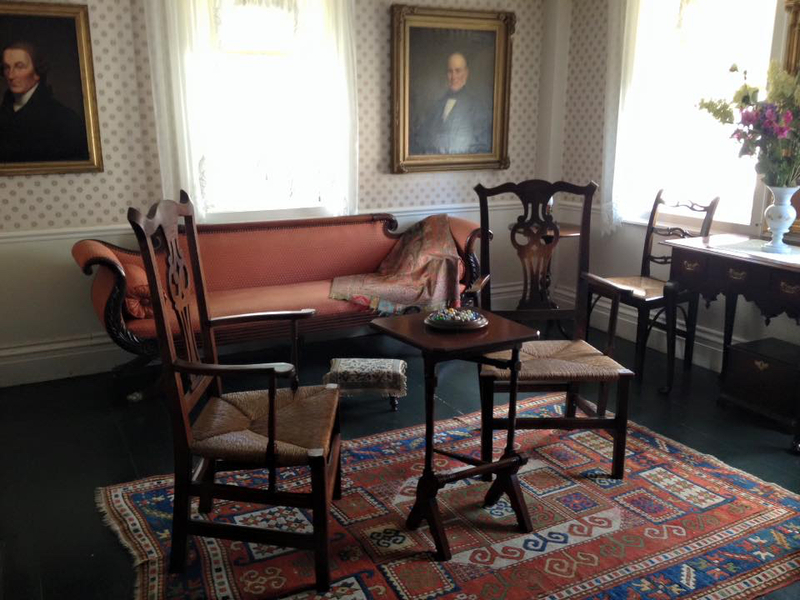 We learned about handling furniture and conservation practices at Historic New England with Senior Conservator Alex Carlisle and Senior Curator Nancy Carlisle. 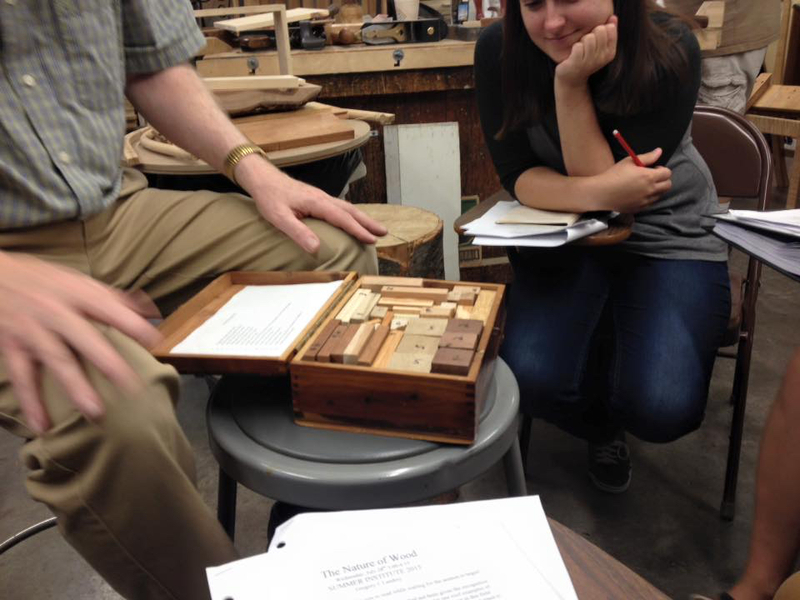 At the North Bennett Street School, Winterthur’s Gregory Landry and furniture-maker Steve Brown taught us all about craftsmanship and wood identification (one of the trickiest aspects of cataloguing by far). And, finally, at the Golden Ball Tavern Museum in Weston, we had the opportunity to learn professional photography and photoshop techniques so that anyone can access the best quality images and information about the furniture they seek on the BFA’s online database: http://content.winterthur.org:2011/cdm/home/collection/bostonfurn. After that week of intense hands-on training, we were pumped and ready to get on the road! Our first stop was the Spooner House (c.1743) at the Plymouth Antiquarian Society in Plymouth, MA. Right up the road from Plymouth Rock, this lovely historic property features objects descended directly from its original eighteenth-century occupants. Happily, we were welcomed by Am Civ alum Anne Reilly, now the executive director of the Plymouth Antiquarian Society! Our journey begins at the Spooner House! Our first day was a real eye-opener: thinking we could breeze through catalogue sheets that were as long as eleven pages, we soon learned the challenges of looking at furniture with a critical gaze. Using wood samples, UV flashlights and magnifying glasses, we first looked at every panel, leg, and frame of a seemingly “simple” Federal card table to determine the primary and secondary woods. 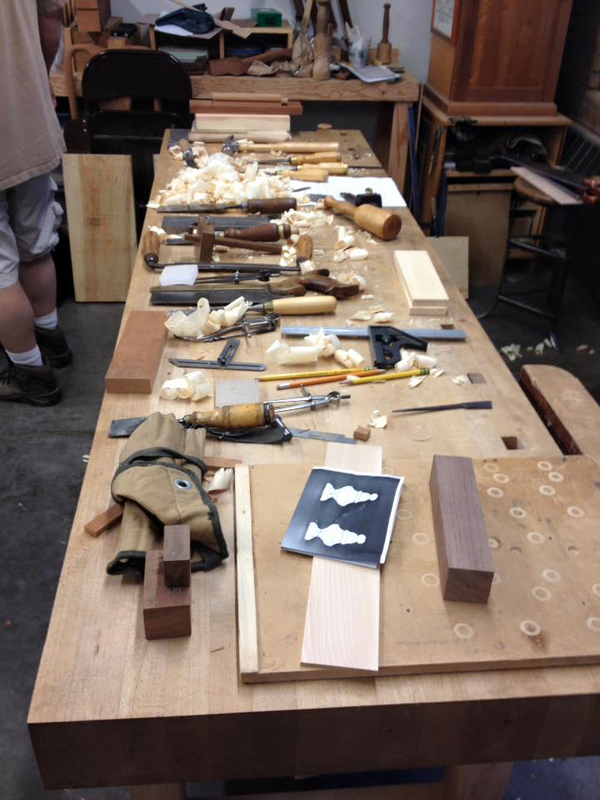 Often the answers eluded us–was that porous hardwood mahogany? Or walnut? What about the figured veneers–might it be burled maple? Another crucial component was the means of construction, and whether the piece was handcrafted or machine-made. Certain things are dead giveaways to the former or latter, such as nail shape and size, saw marks, and joinery techniques. Of course, there’s also the style of a piece. Inlays, banding, and therm legs (or squared, tapered legs) certainly indicate the card table was from the Federal Period (1790-1815), but we might encounter revival styles in the future–or even reproductions! 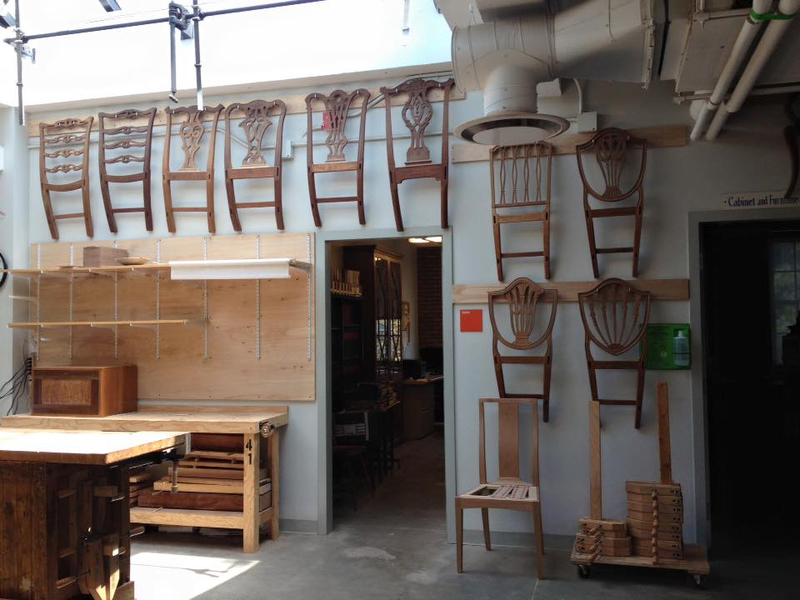 Most importantly, our mission is to contribute to Boston’s furniture-making history. It’s been pointed out to us time and time again how little research and scholarship exists for this subject, as most furniture after the eighteenth century is attributed to New York or Philadelphia. The work we do this summer, at places like the Bostonian Society, Gibson House Museum, and New England Historic Genealogical Society, provides much-needed materials for historians of material culture in their ongoing and future projects. 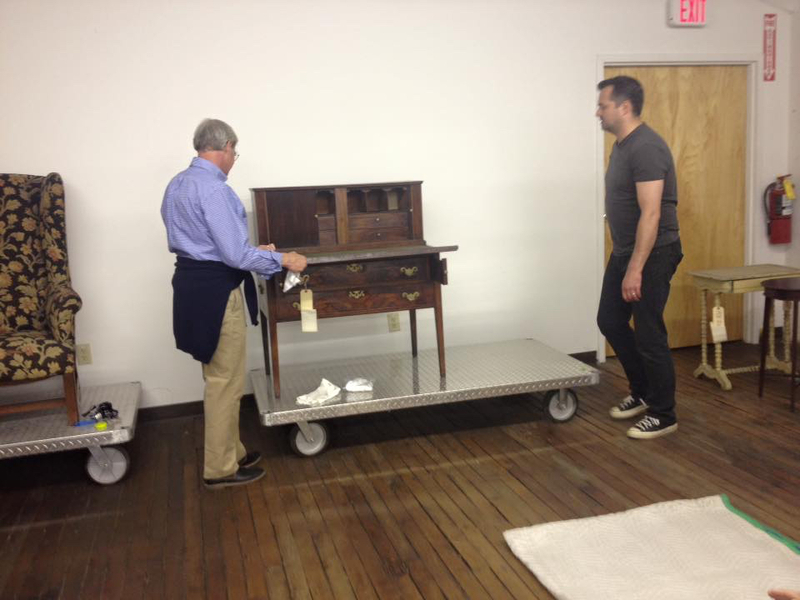 My own research examines how historical memory, craftsmanship, and American culture intersect and inform one another, and the benefits of having a resource like the Boston Furniture Archive are not to be underestimated. So often, our education in material culture comes from books, or museums, or the archives. Actually being able to handle furniture and comprehend their design and construction goes a long way towards enriching one’s education. Furniture historians in their natural habitat! We have a busy summer ahead of us, and I hope to update the Am Civ blog as we make progress! About the Author: Erica Lome is a student in the History of American Civilization Ph.D. program at the University of Delaware. This fall, she will be a Graduate Assistant at Nemours Mansion & Gardens. You can find her at http://ericalome.com/.